Page revised in December 2016. Links to this page can be found in Book 2, Map B1, Day 1 and Day 3, View C5 and Rione Campo Marzio. Giuseppe Vasi chose Piazza del Popolo for the opening etching of his 1752 book on the squares of Rome; he had two possible options for showing the square; he eventually did not make a choice because in the book he depicted Piazza del Popolo from its southern end and in a small etching in the title page he showed it from its northern end. The main etching focused on S. Maria del Popolo and Porta del Popolo and on the long queue of carriages waiting to make their entrance to Via del Corso during the Roman carnival. J. W. Goethe described in Italian Journey this unusual traffic jam in January 1788: As evening draws near, more and more people press into the Corso. The carriages have come to a standstill long ago. It can happen that, when night falls, they haven't been able to budge for two hours. (..) When one coachman backs, all those behind him have to back too. The guards start cursing and threatening him. (..) Either he must get back into line or drive into a side street, but these are usually already full of standing carriages, which came too late to get into the Corso, because the vehicles there had already ceased to circulate (translation by W. H. Auden and Elizabeth Mayer - Collins). A similar scene was described by Charles Dickens in an account of his arrival in Rome in January 1845: We entered the Eternal City, at about four o'clock in the afternoon, by the Porta del Popolo, and came immediately on the skirts of the Carnival. We did not, then, know that we were only looking at the fag end of the masks, who were driving slowly round and round the Piazza until they could find a promising opportunity for falling into the stream of carriages, and getting, in good time, into the thick of the festivity. C. Dickens - Pictures from Italy - 1846. The small etching showed the Tridente (hayfork), the three streets ideally departing from the obelisk at the centre of the square: Via del Babuino leading to Piazza di Spagna (left), Via del Corso leading to Piazza Venezia (centre) and Via di Ripetta leading to Porto di Ripetta (right). Prior to the development of railway this was the first view of Rome for travellers coming from the north. This plate is rather academic, whereas Giovanni Battista Piranesi, a contemporary etcher, chose a different viewpoint resulting in a less formal scene (you may wish to see it in an another window). The view of the main etching is taken from the green dot in the 1748 map below, that of the small etching from the blue dot. 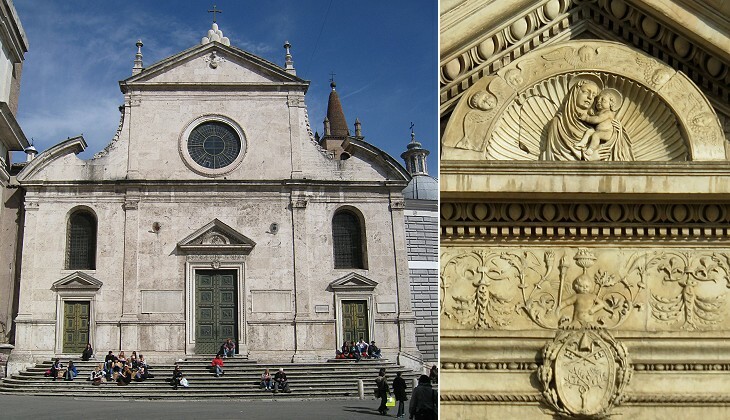 In the description below the plate Vasi made reference to: 1) the obelisk and the fountain; 2) S. Maria del Popolo; 3) Porta del Popolo; 4) S. Maria dei Miracoli. The small map shows also 5) S. Maria in Montesanto; 6) Palazzo Sterbini; 7) Via Laurina. During the annexation of Rome to the French Empire several projects were developed to redesign Piazza del Popolo in conjunction with the opening of large gardens on the Pincio, the hill overlooking the square; the changes were eventually completed by architect Giuseppe Valadier in 1818, after the return to Rome of Pope Pius VII and the restoration of the Papal State. 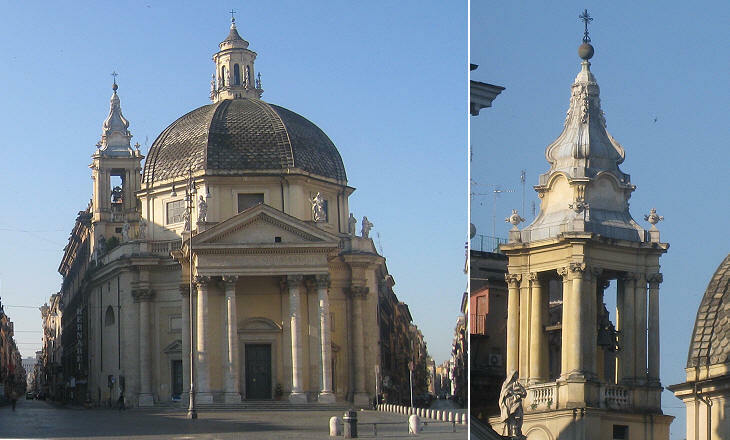 The redesign of Piazza del Popolo had a minor impact on the view of the Tridente; the comparison between today's image with the etching by Vasi shows that the bell towers of the almost twin churches were built at a later time: in 1758 that of S. Maria in Montesanto (left) and in 1765 that of S. Maria dei Miracoli (right). Valadier enlarged the square by adding two large half circles flanked by identical buildings which were much criticized for their unassuming design; the overall size of the square was deemed to be excessive in relation to those of the churches and of the obelisk. Piazza del Popolo is a preferred location for the final rally of a political campaign. 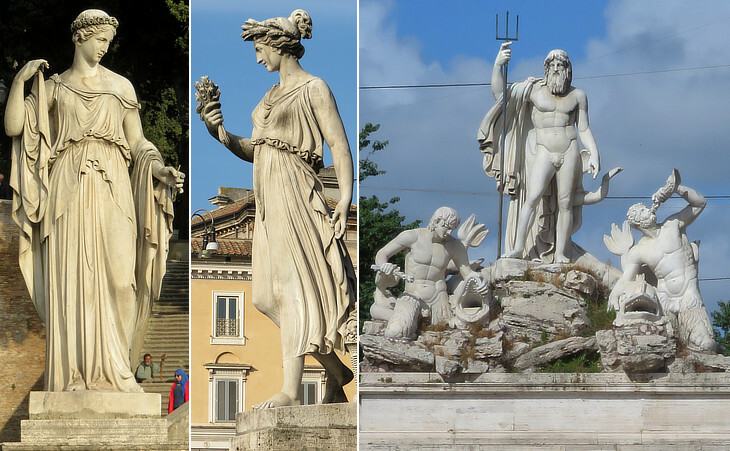 Statues portraying a personification of Rome between the rivers Tiber and Aniene by Giovanni Ceccarini; at their sides two columns with "rostra"
The original French project included the erection of Dea Roma, a statue of a personification of Rome which decorated Villa Medici on Terrazza del Pincio; this idea was scrapped after the return of Pope Pius VII, but the overall decoration of the square continued to be marked by a celebration of Ancient Rome, which in the past the popes had avoided, unless it was accompanied by some references to the Christian religion. 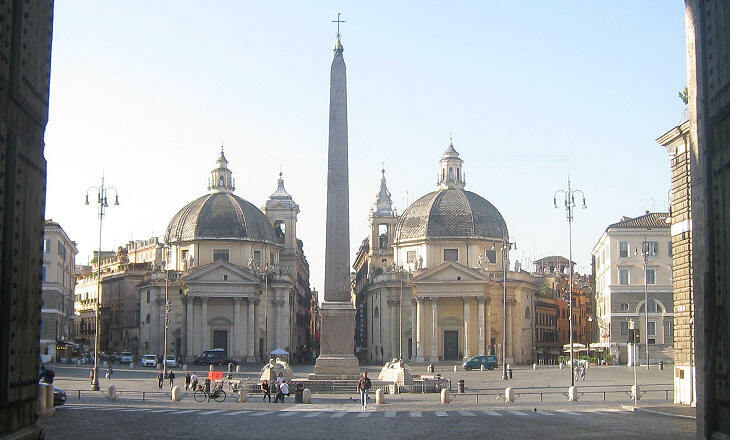 In conclusion one could say that there are two distinct Piazza del Popolo; one on a north-south axis with a Renaissance/Baroque character and one on an east-west axis which has a typical Neoclassic design; they have in common the obelisk, but otherwise they seem to ignore each other. The inner side of Porta del Popolo (the outer side is shown in another page) celebrates the arrival in Rome of Queen Christina of Sweden in 1655, but the decoration is actually a celebration of Pope Alexander VII, because the six mountains and the star are heraldic symbols of the Pope. In the festoon Bernini united oak branches (another heraldic symbol of the Pope) with ears of wheat, supposedly a symbol of the Vasa (or Wasa), the Swedish royal family. 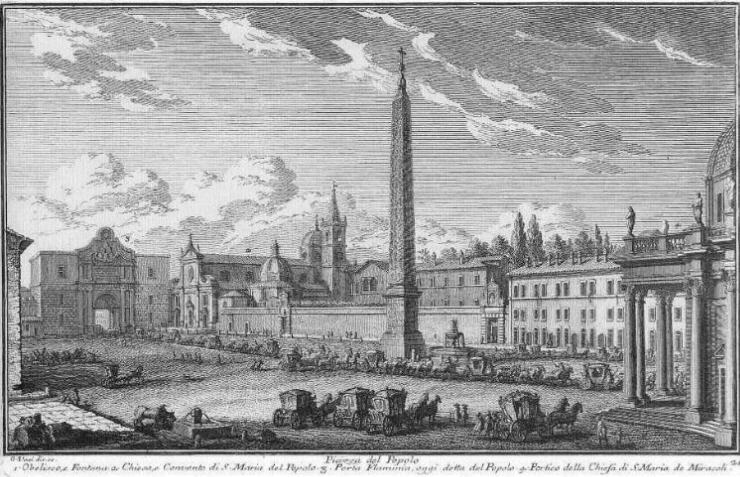 In 1586 Domenico Fontana, at the request of Pope Sixtus V, relocated a standing obelisk from the side of S. Pietro to the centre of the square in front of it; the successful completion of the move led the Pope to order the restoration and relocation of three other ancient obelisks in the frame of an overall redesign of modern Rome. 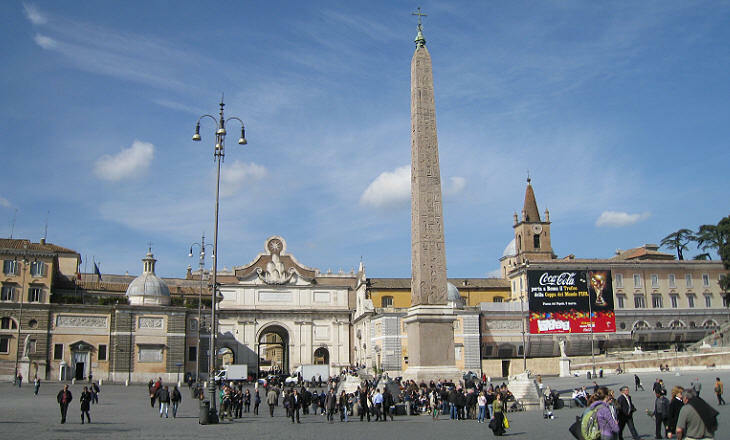 In 1589 one of the two obelisks which stood on the ground of Circus Maximus was moved to Piazza del Popolo and placed at the junction point of the Tridente. 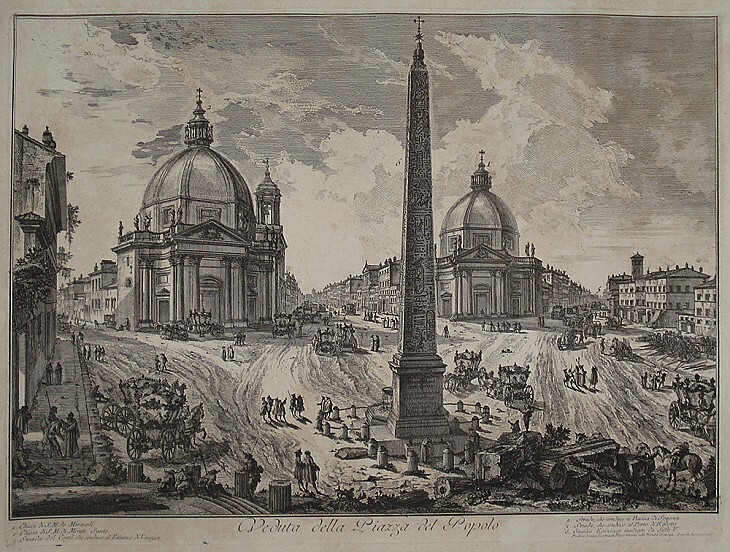 The obelisk was erected in Heliopolis and it celebrated Pharaoh Rameses II and his father Seti I; it was brought to Rome by Emperor Augustus; it was relocated to Piazza del Popolo because Pope Sixtus V wanted to highlight the importance of S. Maria del Popolo, which he had decreed could replace S. Sebastiano as the seventh basilica to be visited by pilgrims. 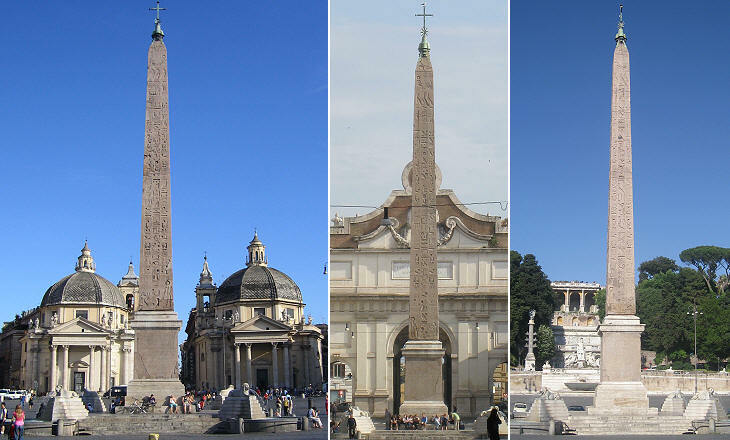 You may wish to see all the obelisks of Rome in one page. Prior to the relocation of the obelisk the centre of the square was marked by a fountain designed by Giacomo Della Porta in 1570. 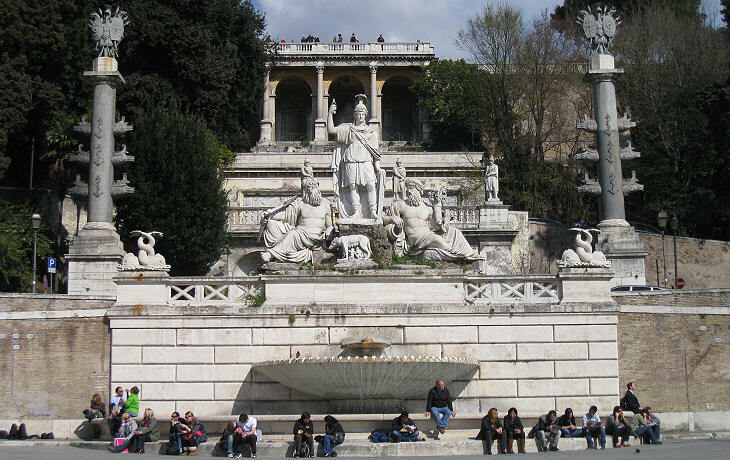 It was the first of a series of fountains for the distribution of Acqua Vergine, an ancient Roman aqueduct which was reactivated by Pope Sixtus IV and then ameliorated by Pope Gregory XIII; the fountain was slightly moved towards Via del Corso to make room for the obelisk. 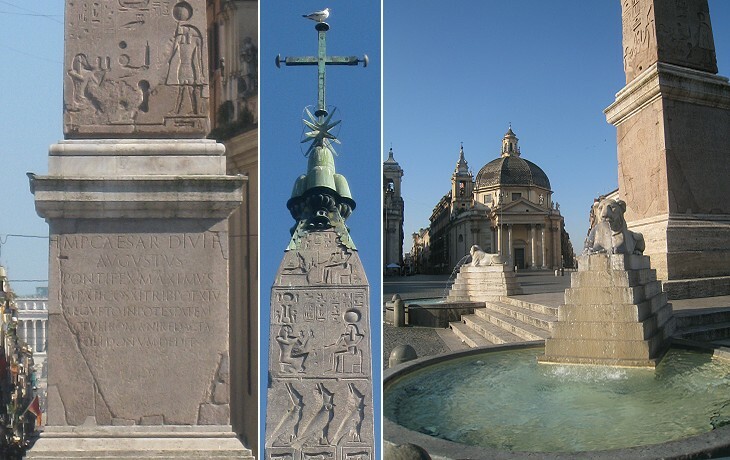 In 1823 Giuseppe Valadier designed four small fountains surrounding the obelisk. 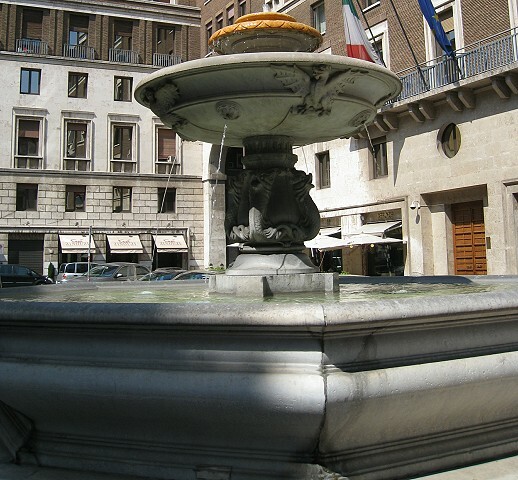 The old fountain was relocated opposite S. Pietro in Montorio; in 1940 it was moved to Piazza Nicosia and slightly modified (it opens in another window). For a long time the reference to popolo (people) was believed to be a corruption of pioppo (poplar); in recent years records have been found which indicate that the church was built in 1099 at the expense of the municipal authorities and that therefore the church was called Sancta Maria Populi Romani. The medieval church was entirely rebuilt for the Jubilee Year 1475 by Pope Sixtus IV; the design of the façade and of most of the decoration of the interior is attributed to Andrea Bregno and his assistants. In 1655-661 Bernini redesigned in part the façade and the interior; you may wish to see the façade as it appeared in a 1588 Guide to Rome. 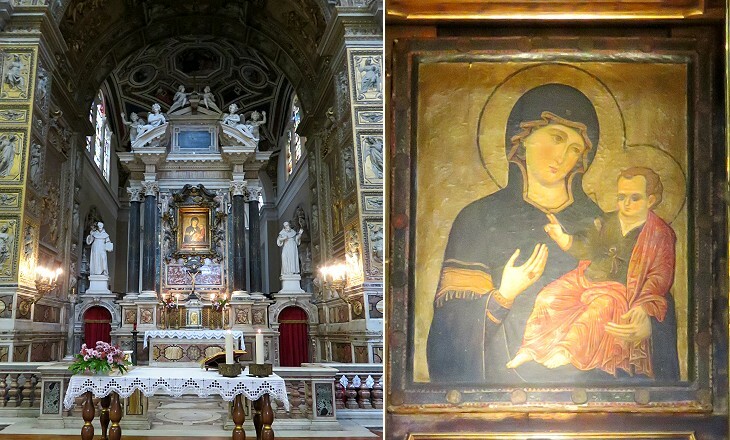 Similar to S. Maria sopra Minerva, S. Maria del Popolo is a museum inside a church because it houses works from Pinturicchio, Raphael, Caravaggio, Bernini and many other artists of the Renaissance and of the XVIIth century. In 1472 the church was assigned to the Augustinians and a deep presbytery was built for the monks to attend ceremonies (it can be seen in the small map). Bregno designed an altar to house a miraculous image of the Virgin Mary which Pope Gregory IX donated to the church in 1235. It was previously in S. Giovanni in Laterano and it is dated XIIth century, although the tradition says that it was an acheiropoieta image, i.e. it was not painted by human hand. In 1627 the main altar was completely redesigned at the initiative of Pope Urban VIII (the old altar was relocated to the Baptistery chapel). As a consequence the presbytery was completely separated from the rest of the church . 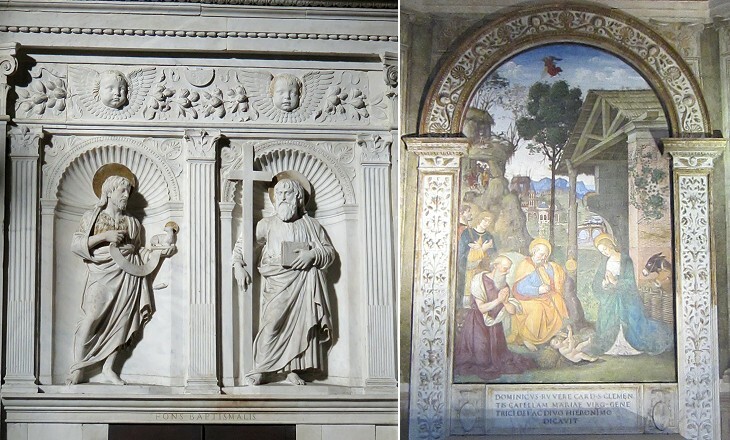 It contains two funerary monuments by Andrea Sansovino to Cardinal Girolamo Basso della Rovere, nephew of Pope Sixtus IV and best known for having promoted the decoration of Basilica della Santa Casa di Loreto and to Cardinal Ascanio Sforza, brother of Ludovico Sforza, Duke of Milan. 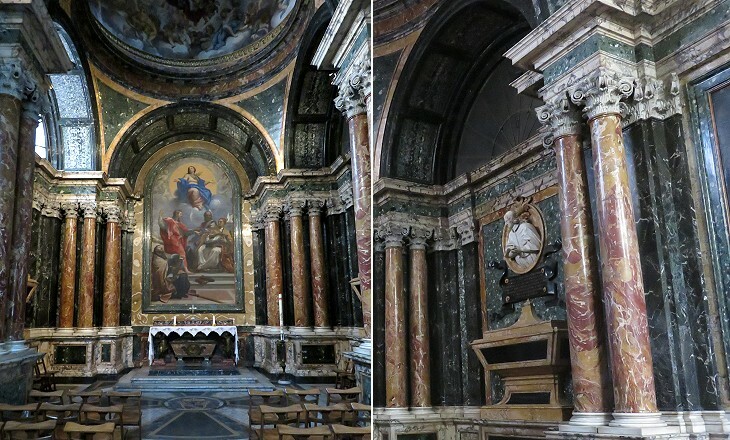 The della Rovere, the family of Pope Sixtus IV and of Pope Julius II had their family chapel at S. Maria del Popolo; this explains why so many coats of arms of the della Rovere can be seen in the church, including those of Cardinal Domenico della Rovere who built a palace in Borgo which is best known as Palazzo dei Penitenzieri. The church houses many examples of the change in taste which occurred between the early Renaissance and the XVIIth century; in the former period art was aimed at defining patterns of elegance and beauty in a harmonic frame for an aesthetic pleasure, in the latter period it was aimed at conveying strong emotions to the believer, even by a gruesome representation of Death. When the interior of the church was redesigned by Bernini a number of funerary monuments and other reliefs were removed. Some of them can be seen in the narrow corridor which leads to the sacristy. 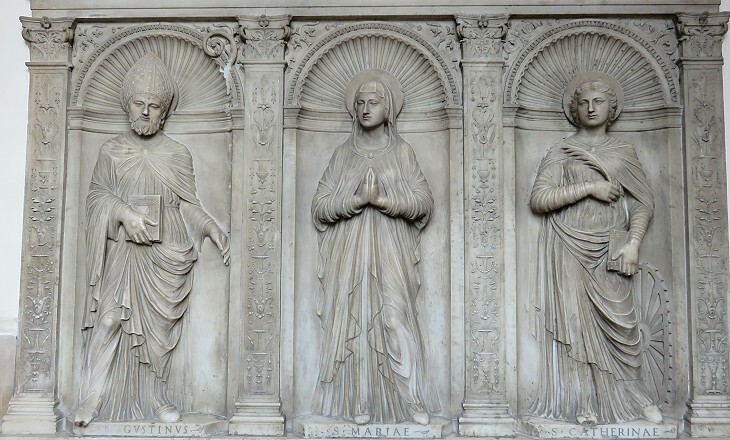 The relief shown above was commissioned by Guglielmo De Pereris, Uditore di Rota, i.e. one of the judges of Tribunale della Rota Romana, the highest civil court of the Papal State. Guglielmo de Pereris commissioned Bregno other reliefs for S. Pietro Vecchio which eventually ended up at S. Pietro Ispano at Boville. 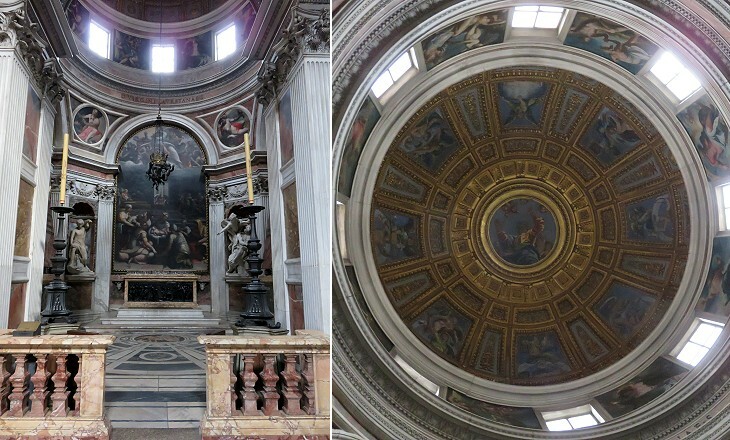 Agostino Chigi, a very rich banker who was on friendly terms with Pope Julius II, chose S. Maria del Popolo for his family chapel, which was designed by Raphael, but it was left unfinished. Pope Alexander VII, a descendant of Agostino Chigi asked Bernini to complete it . 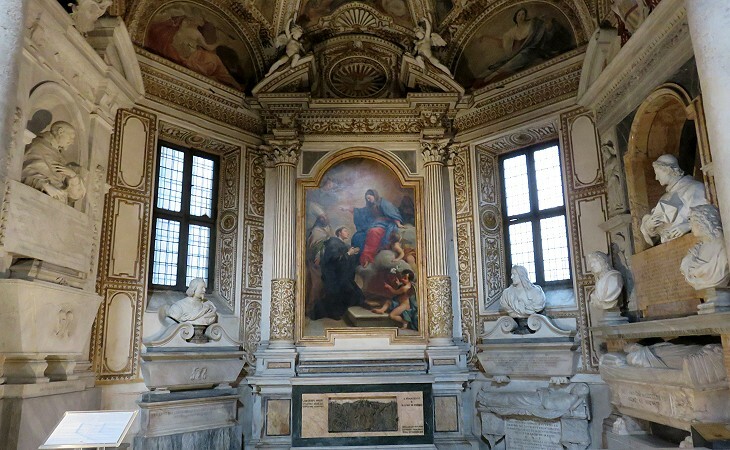 He did the same for another Chigi chapel at S. Maria della Pace, but in that case he assigned the task to Pietro da Cortona, rather than to Bernini. 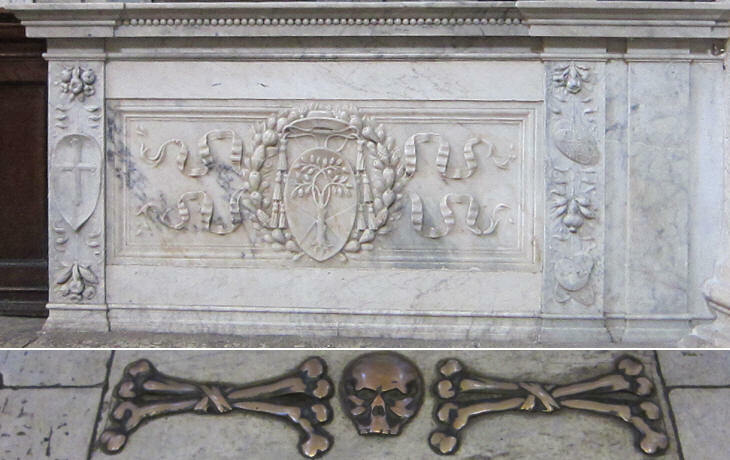 The image used as background for this page shows a coat of arms of Flavio Chigi, a nephew of the Pope, who was appointed titular cardinal of S. Maria del Popolo and supervised the construction of the chapel. Dan Brown set an episode of his novel Angels and Demons in this chapel; read some remarks on its accuracy. The decoration of the chapel was strictly linked to the theme of the Resurrection. It had an octagonal shape and the dome too was partitioned into eight sectors because according to St. Augustine the Resurrection was symbolized by the number eight. The four Prophets portrayed in the statues either foretold the Resurrection of Jesus or performed resurrections themselves. Daniel and Jonah were painted by Michelangelo in the ceiling of Cappella Sistina. 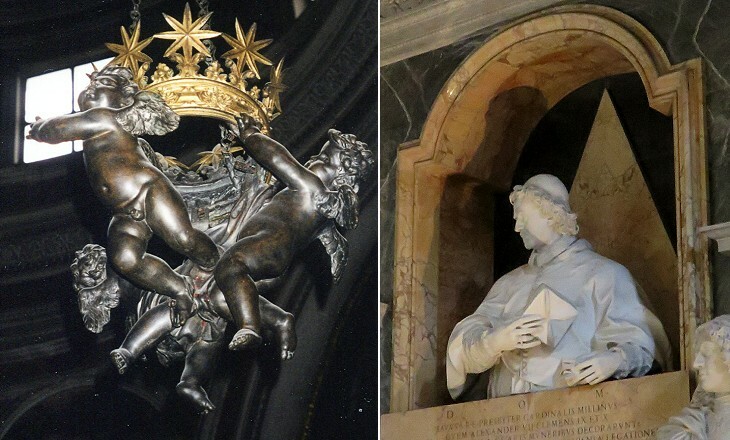 Bernini redesigned also the monuments to Sigismondo and Agostino Chigi and the decoration of the floor of the chapel. 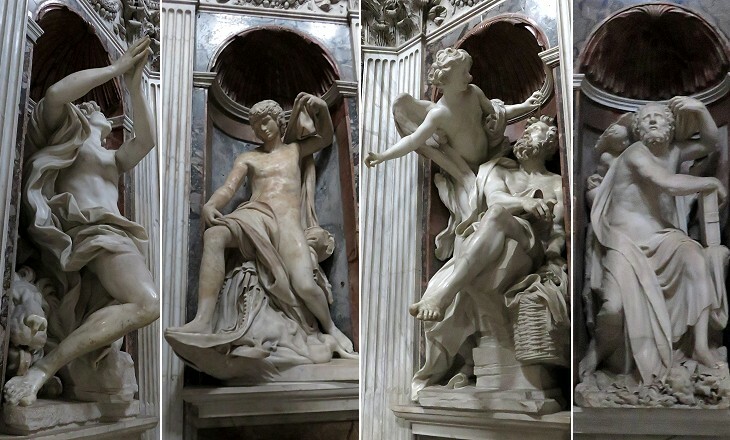 Works of art in S. Maria del Popolo by pupils of Bernini can be seen in pages covering Baroque Angels, Organs and Martyrdoms of Saints (St. Peter by Caravaggio). A separate page is dedicated to the monument to Maria Flaminia Odescalchi Chigi immediately outside Cappella Chigi. The Chigi were not the only ones who renovated their family chapel. This was done by other families, e.g. the Millini and the Cybo. Cappella Millini was redesigned in ca. 1623 and it contains elements of dismantled funerary monuments of the late XVth century. In 1638 Alessandro Algardi portrayed Cardinal Garcia Millini in the act of praying and a similar statue was made by Pierre-Étienne Monnot some seventy years later. The chapel contains a number of busts portraying other members of the family. The Millini or Mellini had a palace in Via del Corso, another one in Via dell'Anima and a villa on Monte Mario. 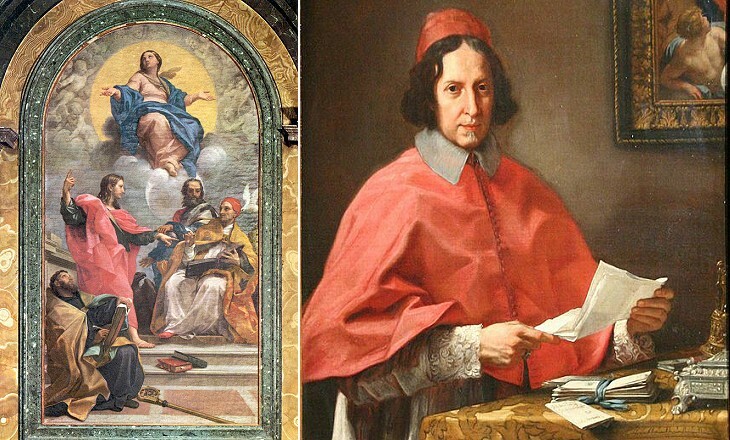 In 1676 Cardinal Alderano Cybo was appointed Secretary of State (a sort of Prime Minister) by Pope Innocent XI. In addition to the trust of the Pope he enjoyed that of King Louis XIV of France. He regarded himself as a likely Pope and he felt that the family chapel in S. Maria del Popolo needed to be redesigned and embellished. The chapel had been founded by Cardinal Lorenzo Cybo, nephew of Pope Innocent VIII, and was decorated with works by Bregno and Pinturicchio. In 1682 Carlo Fontana, the leading architect of the time was charged with the redesign of the chapel. In 1687 when it was inaugurated nothing of the old one was still there. The new chapel stood out for its lavish decoration, but the hopes of Cardinal Cybo did not materialize. His 1698 coat of arms at Santa Aurea, the cathedral of Ostia, can be seen in the Hall of Fame of this website. Notwithstanding the money he spent for the chapel, he left a fortune to his heirs who possessed Massa and Carrara, two small towns in northern Tuscany. The Malaspina are best known for having protected Dante during his long exile. The poet wrote with reference to one of them: O, I have never been through your lands, but where do men live throughout Europe, to whom they are not known? The fame that honours your house, proclaims its lords abroad, and proclaims their country, so that he, who has never been there, knows it. Purgatory - Canto VIII - translation by A. S. Kline. Pope Alexander VII promoted several initiatives to improve the section of Via del Corso from Piazza Colonna (where his family palace was located) to Piazza del Popolo (e.g. the demolition of Arco di Portogallo, an ancient arch which impaired the passage). 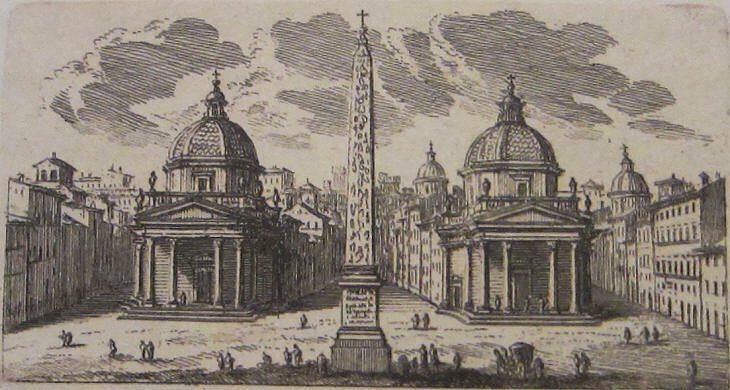 In 1661 he commissioned Carlo Rainaldi the design of two churches at the northern end of the street so that they would provide a monumental entrance to Rome in conjunction with the gate and the obelisk. 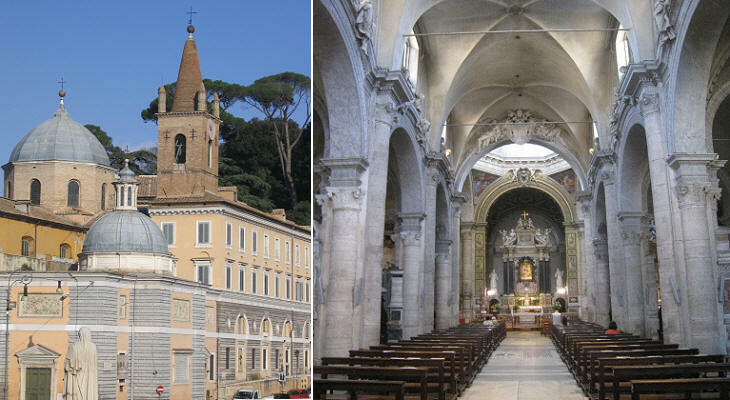 The two churches are not identical; S. Maria in Montesanto was built first and it has an elliptical dome, whereas that of S. Maria dei Miracoli is circular (you may wish to see the two domes from Villa Medici). Another reason why they are not identical is that the space available for their construction was different. The construction of the two churches was mainly financed by Cardinal Girolamo Gastaldi, a member of a wealthy Genoese family, who obtained to be buried with his brother at the side of the main altar of S. Maria dei Miracoli. 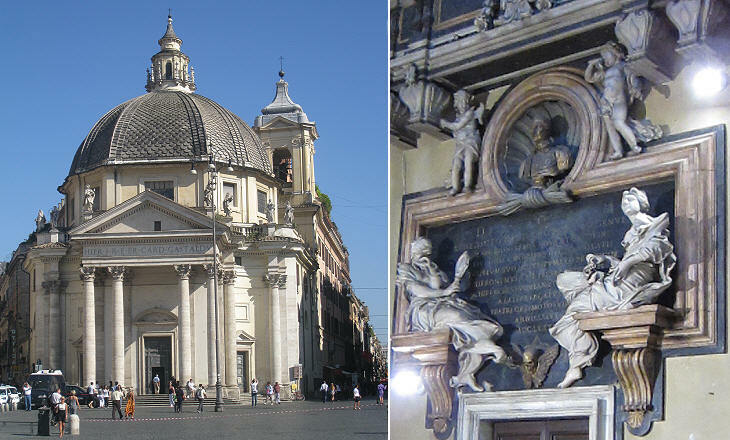 The churches were completed in 1681 and their final design was based on advice given by Bernini. Palazzo Sterbini is an XVIIIth century building in Via del Babuino which belonged to the Boncompagni (who owned nearby Palazzo Boncompagni Cerasi); it was decorated with busts of Roman emperors; it was bought by the Sterbini, a family known for Cesare Sterbini who wrote the libretto for Rossini's il Barbiere di Siviglia. Opposite Palazzo Sterbini a short street leads to Via del Corso; during the Middle Ages and probably until the 1475 Jubilee Year, the access to Via del Corso was obstructed by the ruins of some ancient funerary monuments; pilgrims had to make a detour and pass through this street which for this reason was named Via Peregrinorum. 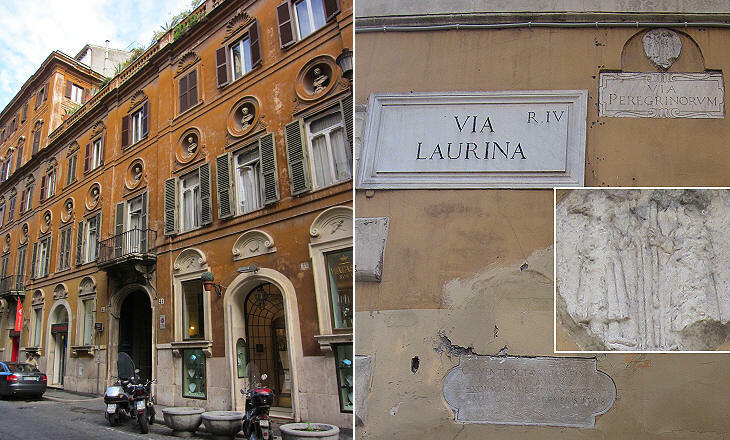 In the late XVIIth century, when the pilgrims accessed Via del Corso from its new monumental entrance, the street was renamed Via Laurina, after Laura d'Este, niece of Cardinal Mazarin and mother-in-law of King James II of England, because she made donations to nearby Collegio di S. Orsola. Next plate in Book 2: Obelisco cavato di sotto le ruine. Next step in Day 1 itinerary: Chiesa di S. Carlo al Corso. Next step in Day 3 itinerary: Piazza di Spagna. 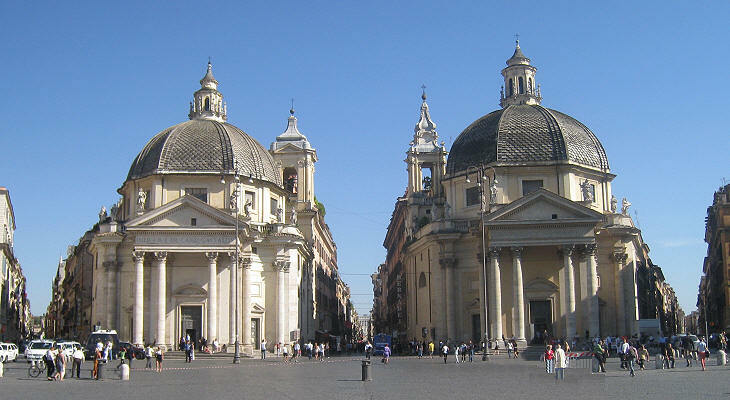 Next step in your tour of Rione Campo Marzio: Porta del Popolo. Si slarga all'entrare di questa porta una gran piazza, ornata di un maraviglioso Obelisco antico e di varj tempj, e fontane. A sinistra della detta porta appoggia la chiesa di s. Maria del Popolo, la quale fu eretta l'anno 1099. da Pasquale II. per cancellare la nefanda memoria di Nerone, le di cui ceneri quivi negli orti di sua famiglia Domizia stettero sepolte. 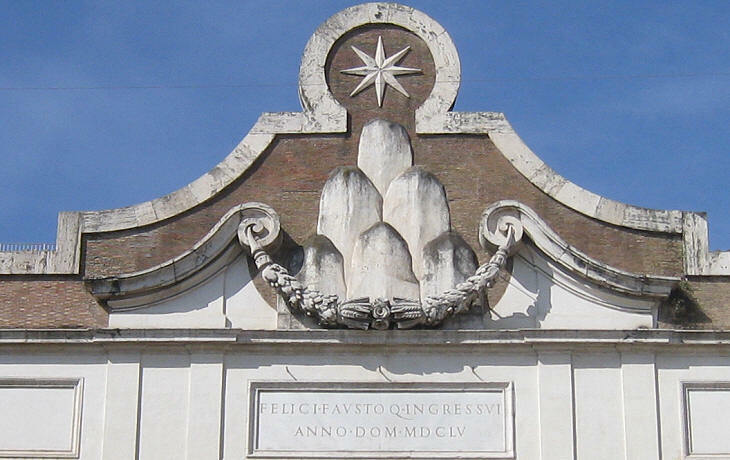 Ed essendo poi nell'anno 1227. riedificata dal Popolo Romano, prese di questo il nome; e perchè si continuasse la devozione verso la ss. Vergine Gregorio IX. riposevi l'immagine della medesima, che stava nella celebre cappella di Santa Sanctorum: E in forma di basilica a tre navi, e fu data in cura ai Frati Agostiniani della congregazione di Lombardia. Giulio II. adornolla di pitture e di marmi; ed Alessandro VII. la rinnovò con disegno del Bernini. Due nobilissime cappelle, oltre quella dell'Altare maggiore, sono in questa chiesa, una a destra del Card. Cibo, e l'altra a sinistra di Agostino Ghigi; e fra le pitture evvi nella prima cappella a destra la Natività del Signore fatta dal Pintorecchio; nella seconda poi ornata tutta di marmi e sculture, evvi sull'altare la ss. Concezione con 4. Santi dipinta da Carlo Maratti, e di laterali sono uno di Monsù Daniele, e l'altro di Gio. M. Morandi: le pitture però a fresco nella cupola sono di Luigi Garzi. Il s. Agostino colla ss. Vergine nell'altra cappella è del detto Pintorecchio, e la Visitazione di s. Elisabetta nell'altra è del Morandi suddetto; l'Angelo però a destra è scultura di Ercole Ferrara, e l'altro a sinistra di Gio. Antonio Mari. Il s. Tommaso di Villanova nella cappella, che segue, è di Fabbrizio Chiari, e le pitture nella cupola della chiesa sono del Vanni. Il nobilissimo altare maggiore, in cui si custodisce l'immagine della ss. Vergine fu fatto da Urbano VIII. con disegno del Cav. Rainaldi, e i due sepolcri nel coro sono sculture di Andrea Sansovino. Il quadro dell'Assunta nella cappella che segue, è di Annibale Caracci, e i laterali di Michelangelo da Caravaggio; però le pitture nella volta sono d'Innocenzo Tacconi, ed il resto di Gio. Batista Novara; le pitture e statue nell'altra cappella sono di Giulio Mazzoni. L'altro quadro nella crociata è di Bernardino Mei, l'Angelo a destra è scultura del Raggi, e quello a sinistra del Mari. Le pitture nella cappella che segue sono di un Fiammingo, e quelle nell'altra di Gio. da s. Giovanni; li depositi però furono fatti col disegno dell'Algardi. Siegue appresso la celebre cappella fatta da Agostino Ghigi con disegno di Raffaele da Urbino, e con i suoi contorni fu dipinto il quadro dell'altare da Fra Sebastiano del Piombo; li mosaici nella cupola furono similmente cavati da' cartoni di Raffaello; le lunette però sono del Vanni. La statua di Elia e quella di Giona furono scolpite da Lorenzetto con disegno, e direzione di Raffaello, e però pajono antiche; le altre due e i depositi sono opere del Cav. Bernino; il paliotto dell'altare con i bassirilievi, e candellieri di metallo sono opere del mentovato Lorenzetto; il quadro nell'ultima cappella e di Pasqualino de' Rossi, ed il resto di pitture e sculture in varj altri luoghi della chiesa sono riguardevoli, ma per brevità si tralasciano. Come la porta, e la chiesa suddetta, così chiamasi questa gran Piazza, in mezzo alla quale si vede il maraviglioso Obelisco, colla ss. Croce inalberata in legno di nostra santa Religione. Questo smisurato sasso, fu un opera delle più ammirabili de' Re di Egitto, fatto in tal forma da Semneferteo, che regnò 522. anni prima della nascita del nostro Redentore. È alto palmi 108, e col piedistallo 145; nel suo vivo è largo palmi 12. e mezzo, e nelle 4. faccie è lavorato con note e simboli Egizj, cavato in un sol masso di granito rosso. Da Eliopoli lo condusse in Roma Augusto, e lo eresse nel Circo massimo, ove poi giacque con tante altre rarità sotto le rovine fino al Pontificato di Sisto V il quale nel 1589. quì fecelo trasportare, facendovi collocare nella sua cima il segno della ss. Croce sopra il Tuo stemma, il tutto fatto di metallo alto palmi 17. e mezzo, sicchè dal piano si contano palmi 162 e mezzo. Il fonte, che adorna il piede di questo, è notabile per la tazza superiore, perchè ricavata da una base delle colonne, trovate nel giardino Colonnese. Avevano i Frati Riformati del Terz'Ordine di s. Francesco Francesi una piccola chiesa presso al Tevere, con una immagine della ss. 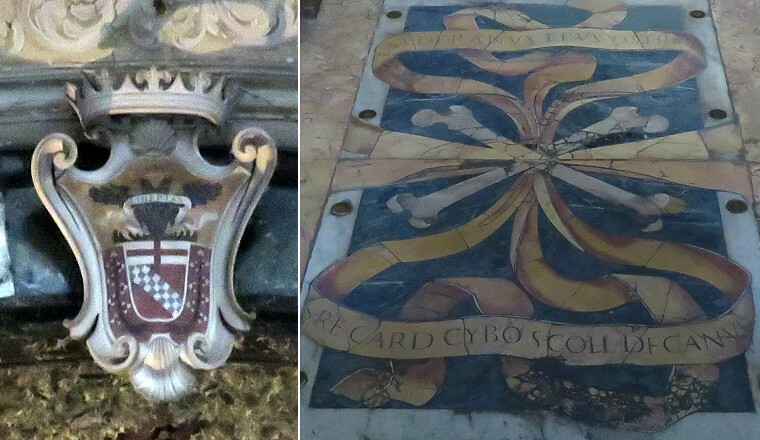 Vergine molto miracolosa; e perchè fosse tenuta con maggior decoro, fu da Alessandro VII. ordinato, che si facesse quivi una chiesa col disegno del Cav. Rainaldi; ma essendo mancato il Pontefice, fu proseguita la fabbrica dal suddetto Card. Gastaldi Genovese, con gli avanzi dello spurgo fatto in tempo del mal contagioso, poco prima sofferto da questa Città, e ne ebbe la direzione il Cav. Bernini, che ridusse la chiesa in figura ovata con cupola, e portico esteriore. Sono in questa delle cappelle ornate di pitture e marmi: specialmente l'altare maggiore è ornato ne' laterali con depositi, le cui statue e putti sono di Antonio Raggi, e i busti di metallo del Cav. Lucenti.